LANSING — On April 14th, Michigan Gov. 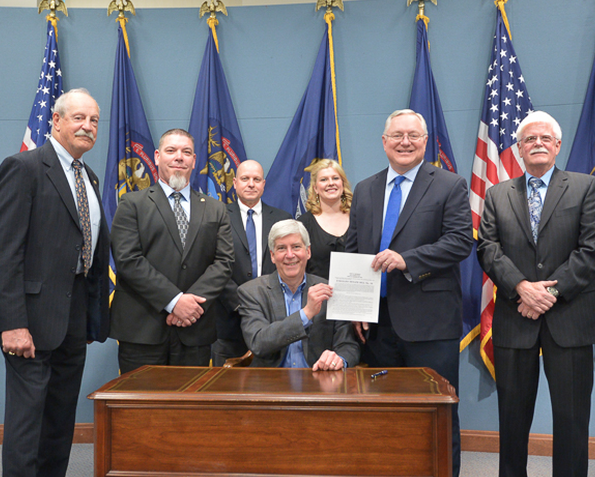 Rick Snyder signed Senate Bill 53 that will correct an oversight in a law for retired federal law enforcement agents. The bill will take effect 90 days after the signing. Michigan statutes regulating the licensing of individuals to carry a concealed pistol had designated certain places “gun free zones,” such as schools, places of worship, sports arenas, taverns, etc. Retired law enforcement officers with a concealed pistol license were exempt from the gun free zone restriction. The problem: The statute had defined a retired LEO as an individual who was a police officer certified pursuant to Michigan law and retired in good standing from their agency. Consequently, under the statute retired federal LEOs by definition were not retired LEOs and were not exempt from the gun free zone restriction. The amendment to the the statute (SB 53) signed by Gov. Snyder adds federal LEOs as defined retired LEOs. Now, retired federal agents will be exempt from the gun free zone restriction. Greg Stejskal, Detroit Chapter SFAFBI; William Hampstead, Pres. Mich. chapter FLEOA; Mark Holloway, retired Border Patrol; Gov. Rick Snyder; Sen Rick Jones, who introduced the bill and was formerly Sheriff Eaton County; Sandra McCormick, Senator Jones’ Chief of Staff; Bob Getschman, W. Mich. Chapter SFAFBI. All of the above pictured with the governor were involved in helping shepherd the bill through the legislative process. Posted: 4/20/15 at 5:29 PM under News Story.